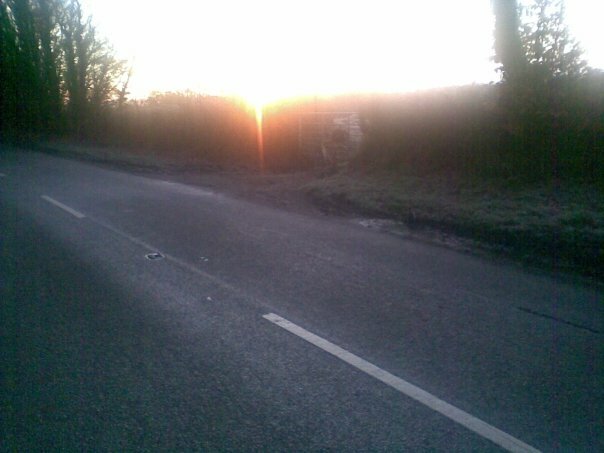 How to get up early and out on the bike. Some people say that to get out first thing in the morning on the bike requires epic amounts of determination and get-up-and-go. I have to agree that getting out of the house before work to ride some miles does need some gumption but there is a thing or two you can do to make it easier and more possible. The most important tip is to not think about it. So, get out of bed, get the cycling clothes on, quick cup of tea, quick breakfast (if that works for you) and out. Do not say to yourself the night before “I’ll see what it’s like”. It will be no surprise that first thing in the morning in the winter it will be at best dark and cold. It will not be particularly inviting. If you have to think about it, it will probably seem to be a bad idea. The night before get everything ready that you need, clothes for example. Find them and put them ready to throw on. I won’t describe the clothes I use for cold morning starts but big gloves and socks feature. I am from the “breakfast first” school of thought and my breakfast in these circumstances is usually muesli with milk. Which takes about 10 seconds to “prepare” and 60 seconds to eat. Again, don’t think. Eat. Have a route in mind that will get you back to base in plenty of time for a shower and a cup of tea before work. Don’t do any route where you have to look at a map beforehand. Once you have got out there though, the morning is often lovely to behold. Sunrise is usually well worth seeing. Well put. I agree completely. Don’t think, just do. And once you’re out there, it can be so rewarding. 100% agree – even on SAs warmer days, I use the exact same routine because thinking=not riding for me also. I won’t tell you where I eat my muesli – even my g/f finds it disgusting, but it saves time which means less time to prevaricate before I’m out the door. Totally agree. Can’t wait for my back to heal so that I can get back out cycling. I work 12 hour shifts, and I commute 40 mile roundtrip on the bike 3-4 days a week. Just getting on with it is the key, however, I will not ride if there’s any sign of ice on the roads. I’ve been told this many times over the internet, but the cost seems prohibitive, and is it worth it just for 2-3 weeks of the year? I’d say yes, of course, because I hate not to be riding, but my pocket says no! So true. If the bike, clothes, bottles etc are not ready there I’ll faff around all morning.